Today, when you order "Showoff with Coins", you'll instantly be emailed a Penguin Magic gift certificate. You can spend it on anything you like at Penguin, just like cash. Just complete your order as normal, and within seconds you'll get an email with your gift certificate. Showoff with Coins (2 DVDs) Your coin magic will never be the same! Learn more than 70 showoff moves in TWO JAM-PACKED DVDS! An incredible value for anyone passionate about visual coin magic. Highly recommended! 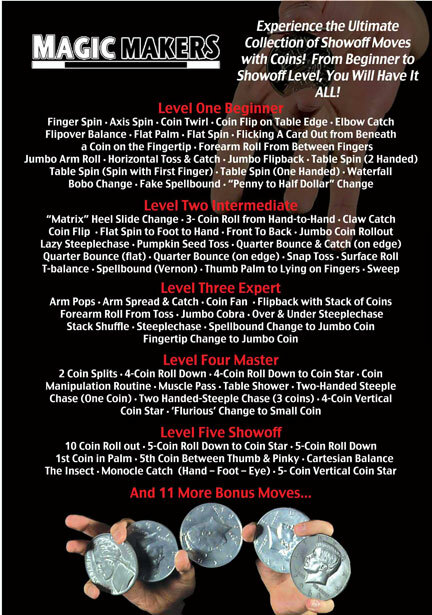 Learn over 70 showoff moves with coins in this two DVD set! You'll learn easy moves such as the basic elbow catch to complicated flourishes like the 10 Coin Roll Out! Can you complete all five levels? In the market of coin magic, there is a lot of competition. This DVD was a great example of coin trickery, but I wouldn't say its' the best out there. Pretty sold handling and practice is required for any such coin manipulation, but coin magic is really meant to be easy to master once you've paid for a DVD like this, and I don't think this DVD quite cuts it. It's more an example of what you should practice for years... and less what can impress people within a reasonable amount of practice time. I'd pass I think, next time. I got this free with a promotion, and although there are some really good flourishes on here, its a bit overpriced for what it is. I think it's worth learning a few flourishes to make your magic look a bit more classy and this is a good place to find some. This DVD will provice you with more information on coin flourishes than you should ever use in most settings. You will learn a number of flourishes however some are difficult to master let alone use under fire. learn a few that appeal to you and your audience and for most situations this will be just fine. Recommended as noted. There are plenty of flourishes here, and a dozen or so magic effects. 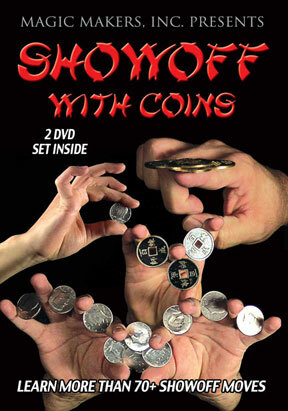 If you love coin magic, but don't know many coin flourishes then you need this DVD set. The flourishes are all organized from simple to hard to extremely difficult. Each one is explained in detail making every flourish within the average magicians grasp...with the right amount of practice. Coin flourishes can be extremely difficult to learn so if you are looking for a good resource you can't go wrong with this one. If your looking for a DVD to learn coin flourishes,this is the one.I haven't seen any other coin DVD on the market that has moves in it like the moves here.If you learn the material on this DVD people will really think your a Pro with coins. If u want to showoff whit coins well buy this dvd simple as that. This DVD should be in every coin worker's library. Ben Salinas and Steve Tippeconnic do an excellent job teaching every coin flourish imaginable. The video quality excellent and the teaching system is slow and clear. All the essentials are covered: coin roll, roll downs, flips, stars, ect... There is also some excellent jumbo coin work.